Betsy Atkins is often asked, “How can I get on a board?” So after 20+ years in the boardroom and multiple roles in public and private companies she is ready to share her secrets. In this book, she teaches you how to build your own personal brand as well as how to keep yourself relevant and growing. She shares tips on how to make your personal network the most effective (and the most enjoyable). Betsy covers the best ways to present your skills and credentials in order to get that board interview, as well as detailed information on how to prepare for it. But getting that board seat won’t be the end of your journey. Once you are on the board, you’ll want to be the best board member you can, helping your companies grow and prosper so that you’ll be able to get that next, even better, board seat. For new CEOs and entrepreneurs, she covers how to make your board work for you and be a true accelerant for your company, the role of the board, choosing new board members (and getting rid of the bad ones), maximizing your board meetings, and building board relationships to ensure success for you as a CEO and for your company. Also included is a collection of articles and learnings from Betsy’s experiences as an operator, board member, and advisor to some of America’s largest and most notable public companies. Fulfilling director responsibilities during a company’s best times can be challenging. Betsy Atkins had the courage to join our board as an Independent Director during a time of company crisis. Betsy provided not only a steady hand but also the focused, strategic thinking and experience in corporate governance necessary to navigate a clear path forward. Betsy’s under- standing of best-in-class compensation philosophies has been invaluable in her role as Compensation Committee Chair, and her diverse experiences in board leadership offer a singular guide for anyone who wants to ‘Be Board Ready’. I believe Betsy Atkins’s deep and broad experience of international board engagements should be very valuable to any board member or CEO. Betsy’s book will bring board candidates and members valuable insights and practical advice on how to participate actively and productively in the governance of a company. Betsy has the rare experience of having served on numerous boards across various sectors and geographies. Her book brings together her learnings from these diverse environments, supported by a hands-on and intimate knowledge of situations that board members have to navigate. An essential read when the governance of companies in the digital age is facing significant challenges, is undergoing major transformations, and requires different approaches in different parts of the world. NASDAQ has always valued best-in-class corporate governance and has partnered with Betsy for years as part of our Governance Clearinghouse, conferences, and in her role as a Nasdaq director. This book captures her insights not only on how to join a board but also on how to be a valued member. She provides terrific, practical advice that can benefit CEOs as well as current and future board directors. Betsy’s book helps new, prospective board members find a seat. She brings her philosophy of engaged, cognitive diversity on how to contribute in the boardroom into actionable steps for directors and CEOs. Betsy Atkins is uniquely qualified to teach how to accelerate building better boards that continuously extend shareholder value creation. As Independent Lead Director at HD Supply and Nominating & Governance Committee Chair, Betsy leads the charge on creating exceptional board of directors composition and dynamics. In today’s environment of activism, global volatility, and both strengthening and emerging competitive threats, rapid, world-class board execution is essential to navigating a winning path for- ward. Betsy’s overwhelming passion to apply hard work, opportunistically identify and engage an extended network of expert talent, and direct board activity to be an incredible business asset and accelerant is a most powerful playbook. Betsy’s book is a road-map for how to join a board and then become a world class contributor. She distills decades of experience as a highly impactful board member into this practical guide. Joining a public Board can be a challenging experience even for the most seasoned business professional. 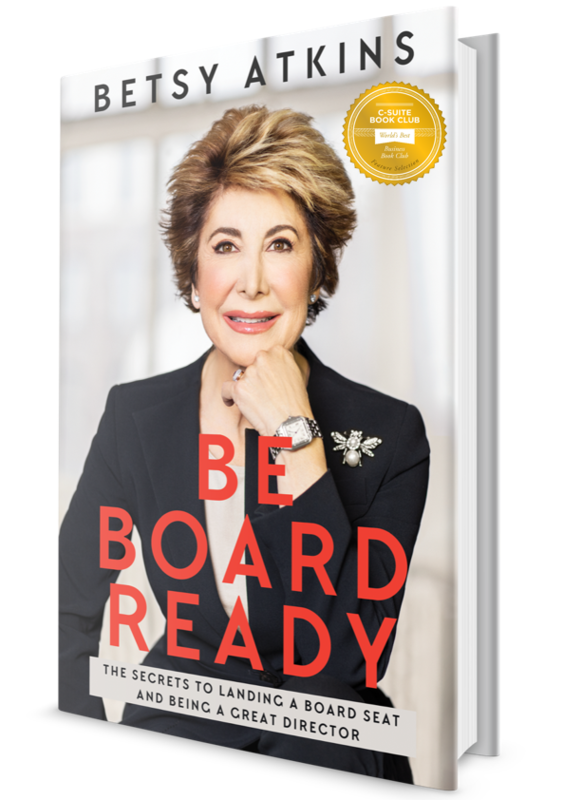 Betsy has such a tremendous knowledge and experience from so many Boards that she draws from in this book to help you manage, enjoy and benefit from as you embark on the journey to be a Board professional. From personal experience with Betsy in the Volvo Cars Board I have learned a lot on how to manage Committees and work in the Board to maximize the benefit for the company, their business partners, their shareholders and importantly their employees. Betsy’s deep board experience is distilled into an action plan on how to join a board, be a valued colleague, and an asset for the business. Her coaching and wisdom is for CEO’s, directors and teaches how to be a world class director and be prepared for what goes on in the boardroom. If you are involved in corporate governance it’s a must read.